Rosary for Pascual Briseno Prieto 80, of Slaton will be held 7:00 P.M. Monday, December 3, 2018 at Calvillo Funeral Home Chapel. A Funeral Mass will be celebrated for Mr. Prieto, at 10:00 A.M., Tuesday, December 4, 2018 at Our Lady of Guadalupe Catholic Church-Slaton with Monsignor Ben Kasteel officiating. Burial will follow at Peaceful Gardens Memorial Park under the direction of Calvillo Funeral Home. 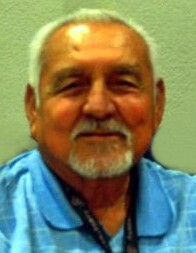 Mr. Prieto was born May 7, 1938 in Karnes City, Texas to the late Joaquin and Stephanie Prieto, he passed away on November 29, 2018 in Lubbock. Pascual was a devoted catholic and a cursillista. He worked as an oil driller for many years, coming from Kennedy, Texas he met his companion Alicia Munoz in Slaton. Pascual spent much of his past times playing dominoes, bingo, fishing and deer hunting, he also had a musical talent and loved playing his accordion. His greatest joy in life however was spending time with his family. He is preceded in death by his parents; a son Santos Prieto; a daughter Minerva Prieto; brothers Jose Prieto, Andres Prieto and Joaquin Prieto Jr.; sisters Petra Saenz and Alexandra Aguilar. Survivors include his companion Alicia Munoz of Slaton; sons Joaquin Prieto III of Canada, Pasqual Prieto Jr. of Irving, David Prieto of Dallas and David and wife Lisa Gonzales of Slaton; daughters Stephanie and husband Henry Santos of Lubbock, Andrea Gonzales of Lubbock, Rebecca and husband Daniel Botello Jr. of Slaton and Angela Cortez of Lamesa; Brothers Stephen Prieto, Angel Prieto, Juan Prieto and Jaime Prieto; sister Adela Juare; twenty-seven grandchildren; nine great grandchildren.